Super Sharp Carbon Steel Blade With a Nonstick Coating. Stuff Points: Earn 18 points when you buy this stuff. A great all-around tool for slicing, dicing, chopping and more. Use it on meat, vegetables, fruit or cheese and the cutting will be effortless. It has a high quality blade made from Japanese carbon steel, and the whole thing is coated in a non-stick material that reduces friction and sticking. The knife will glide through any food quickly, and stuff won't stick, so cleaning after you finish will be fast and easy. An ergonomic handle completes the tool, and it is coated in a soft material to provide a comfortable grip. Available in your choice of colors, and complete with a storage sheath to keep hands safe, and the blade in like-new condition. 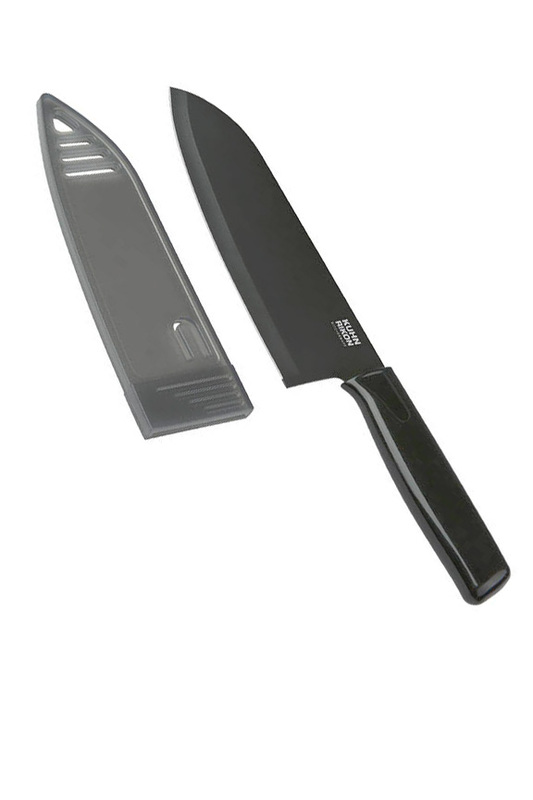 It has a total blade length of six inches, so it's a pretty standard size chef's knife. It's safe to wash in the dishwasher, but hand washing is recommended for maximum longevity. Powerful. Superior carbon steel from Japan ensures a strong blade with lasting performance. Stick-Proof. Easier slicing and easier clean up are guaranteed due to the vibrant, non-stick coating. Safe. Complete with a plastic sheath for storage, the blade and your fingers remain safe when not in use. Portable. The storage cover also makes it perfect for taking to parties, camping, picnics and more. Just grab and go. Colorful. For added appeal, the coloring adds style and functionality. Choose the color that matches your taste or decor. Tired of struggling to cut fruits and vegetables with a dull, low quality knife? Annoyed by mediocre results? Kuhn Rikon's Colori Chef Knife, is the answer. It makes chopping, mincing, dicing and slicing easier than ever. Sleek styling and a colorful, nonstick coating make this knife stand out from the rest, and high quality materials and Swiss design ensure you will get years of use. 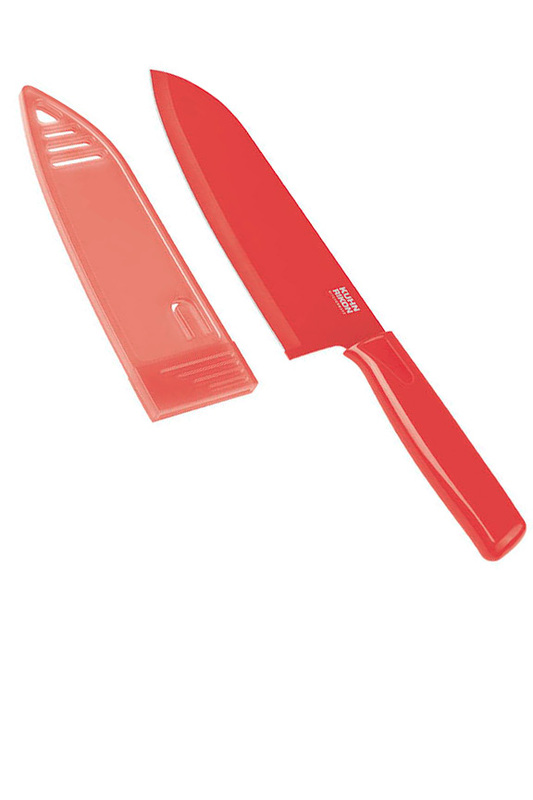 The super sharp blade glides through any food easily, and will never cause fruits or veggies to squish while slicing. You will be able to achieve professional style results, and it will be quick and easy to accomplish. Overall Dimensions 10" x 2"
Bade Dimensions 6" x 2"
High quality materials and superior craftsmanship make this Swiss designed knife perfect for any kitchen. An ideal tool for various food prep tasks. I have purchased 2 Kuhn Ricon knives from your company. I am very pleased. The knives are the sharpest I've ever used. The service was excellent. And the shipping was extremely quick. I will definitely recommend your company to others and will order ahain from you. Thank you. Will this knife cut through chicken bones? Sharp, Serrated Blade With Non-Stick Coating. Style And Performance In One. Cut Long, Thin Sticks With Speed And Precision. A Specialized Vegetable Peeler That Grips And Cuts At The Same Time. Guaranteed To Improve Flavor & Tenderness! Choose From Steel Or Plastic Columns. Storage Made Easy! Use Instead Of Plastic Wrap To Cover Large Containers. Reusable Storage Lids For Every Container In Your Kitchen. Stretch to Create An Airtight Seal. Surgical grade stainless steel and a shorter length combine for amazing precision with everyday cutting tasks. Clip-on dip holder for bowls and plates. Add a side of your favorite dipping sauce to any snack or meal.